Don’t blame it on the Internet. Procrastination dates back to ancient civilization. The Greek poet Hesiod wrote around 800 B.C. not to put your work off until tomorrow and the day after. The ability to select your most important task at any given moment, and then execute that task both quickly and well, will probably have the greatest impact on your success more than any other quality or skill you can develop! If you nurture the habit of setting clear priorities and getting important tasks finished efficiently, the majority of your time management issues will simply fade away. Delete it. What are the consequences of not doing the task at all? Consider the 80/20 rule, that 80% of your results come from only 20% of your actions. Maybe the task doesn’t need to be done in the first place. Delegate. If the task is important, ask yourself if it’s really something that you are responsible for doing. Know your job description and ask if the task is part of your responsibilities. Can the task be given to someone else? Obey the 15-minute rule. To reduce the temptation of procrastination, each actionable step on a project should take no more than 15 minutes to complete. Give yourself a reward. Celebrate the completion of project milestones and reward yourself for getting projects done on time. It will provide positive reinforcement and motivate you toward your goals. Do it now. Do your most important task as early in the day as possible. EAT THAT FROG! Why would anyone ever eat a frog? If the first thing you do each morning is to eat a live frog, you can go through the rest of the day knowing the worst thing likely to happen to you all day is already over. Your frog is the task that will have the greatest impact on achieving your goals, and the task you are most likely to procrastinate starting. On a related note, “If you have to eat two frogs, eat the ugliest one first!” This is another way of saying that if you have two important tasks before you, start with the biggest, hardest, and most important task first. Discipline yourself to begin immediately and then to persist until the task is complete before moving on to something else. Resist the temptation to start with the easier task. 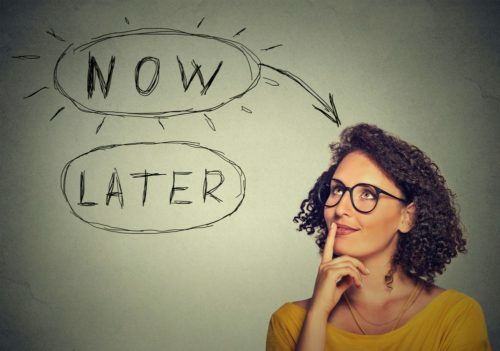 You must also continually remind yourself that one of the most important decisions you make each day is your choice of what you will do immediately and what you will do later, or postpone indefinitely. It is OK to say no to requests from others that are in conflict with your goals. Finally, “If you have to eat a live frog, it does not pay to sit and look at it for a very long time!” The key to reaching high levels of performance and productivity is to develop the lifelong habit of tackling your major task first thing each morning. Don’t spend excessive time planning what you will do. You must develop the routine of “eating your frog” before you do anything else and without taking too much time to think about it. Successful, effective people are those who launch directly into their major tasks and then discipline themselves to work steadily and single-mindedly until those tasks are complete. In the business world, you are paid and promoted for achieving specific, measurable results. You are paid for making a valuable contribution. But many employees confuse activity with accomplishment and this causes one of the biggest problems in organizations today, which is failure to execute. Every type of business has periods of high demand. Whether you’re currently in your busy season or ramping up to it, some preparation right now can help you keep your workload and well-being in check. Before you reach a breaking point with work, make the time and effort to implement some simple steps into your daily, weekly and monthly routines. The key to effective time management, both professional and personal, is goal setting. Working towards a goal will help focus energy and reduce the stress that comes with not having a purpose. Specific: Goals should be clear and state what you want to accomplish and why it’s important. Measurable: Measurable, quantifiable goals let you know when you’re successful. Attainable: All goals, particularly short-term goals, must be achievable with respect to all pertinent constraints. Relevant: Goals must be relevant to the situation and align with other goals. Timely: Goals require specific deadlines. Keeping an overarching positive approach to all goals not only keeps propelling you toward completion but can help release your internal “happy drug”, dopamine. Dopamine produces that feeling of pleasure when goals are achieved. Break down your big goals into smaller goals so you have more frequent dopamine releases. Set goals for the two quarters preceding your crunch time. Based on those outcomes, set goals for each month prior to your deadline. Further break down monthly goals into weekly goals; remember, give yourself the best chance of success! Anytime, but particularly busy times, your calendar is your best tool for managing your priorities and reaching your goals. The secret is to put EVERYTHING in your calendar. Before your first work day of the week, review your calendar to make sure all tasks related to your goals have an appropriate amount of time scheduled. Client and team meetings should be included of course, but look closely at every deadline for the week and make sure time is allotted for everything. Do you need to do research on a unique client circumstance? Schedule it. Is there a client who is typically slow to send required documents? Schedule time to make a list of outstanding materials and send a reminder. Many people find it helpful to also schedule a time block for making and returning phone calls, rather than constantly being interrupted throughout the day. Be sure the timeframe for each task is realistic. There is an abundance of calendar apps and software, for both individuals and teams. A tool that allows setting reminders is helpful for more time-consuming tasks. For calendars shared with others, one nice function is the ability to set a “do not disturb” notice. Sure, things will come up. But set your schedule, protect your boundaries, and you, your colleagues and your clients will all be happy. Do not forget to schedule personal time too! Even during the busiest days and weeks, a healthy, balanced life is critical for meeting goals during the busy season. While it may seem counterintuitive, work-life balance can actually increase productivity. The risks of extended periods of intense work are well documented. Overworking takes a physical toll on your body and health. It can also lead to alcoholism, sleep disorder, depression, and damaged personal relationships. “Me time” doesn’t have to be a spa day or something else extravagant. True “me time” is much simpler. It’s anything you do just for yourself. There is no set expense or time frame to follow when taking “me time.” It can be as simple as taking a walk or browsing the Internet for 15 minutes. The only imperative concerning “me time” is that you actually take it. This is where the calendar comes in! 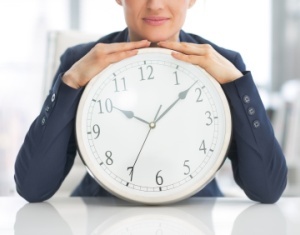 Put your “me time” on your calendar, and honor it as you would any other task or meeting. You will likely have to adjust your personal preferences during busy time, say working out for 20-30 minutes rather than your usual 60 minutes. During busy times, it’s also important to put all personal and family obligations on the calendar, too. Your pet’s annual vet visit, movie night with your family, grocery shopping – life must continue during peak work times. The people in your personal life are likely supporting you during this time. Be sure to thank them and recognize that time with them is equally as important as the time at work. Your calendar is your reliable resource to make sure you keep all the balls in the air. Even with SMART goals in place and reliance on your calendar, everyone struggles with focus at some point. And of course, there are always unforeseen “fires” that pop up. Many people confuse the urgent with the important. Urgent tasks do need to be done quickly, but that does not make them important. We are often stuck completing urgent tasks at the expense of the important ones. Important tasks are the ones that help us meet goals. Often, urgent tasks, such as fixing the copy machine, are distractions from what is important. 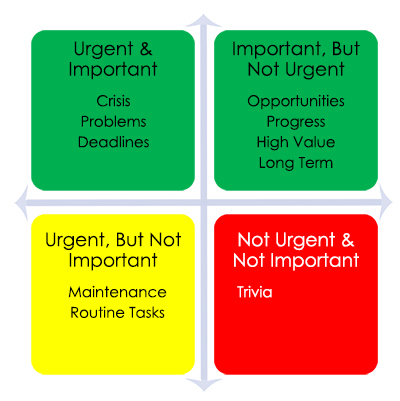 Learning the difference between urgent and important helps maintain focus. Recognize too, when you are not making progress on your tasks. It may be a sign to take a short “me time” break. Maintaining flexibility is an important skill that takes practice. There are many influences on your schedule beyond your control. Being flexible simply means you are not resisting the inevitable changes of life. Flexibility is not passivity. It is being able to embrace change. This will reduce stress and improve focus and balance. For example, clients that do not remit their information on time will impact your schedule, so adjust your calendar for that day and move the late client to another day. Too often, the phrase “it’s a marathon, not a sprint” is used to describe the journey toward meeting goals. However, life can be a bit of sprint during busy time. And like any good athlete, training and preparation are critical. Make the time to set your goals, schedule the time to meet them, keep your eyes on the finish line, and you’ll be a winner.